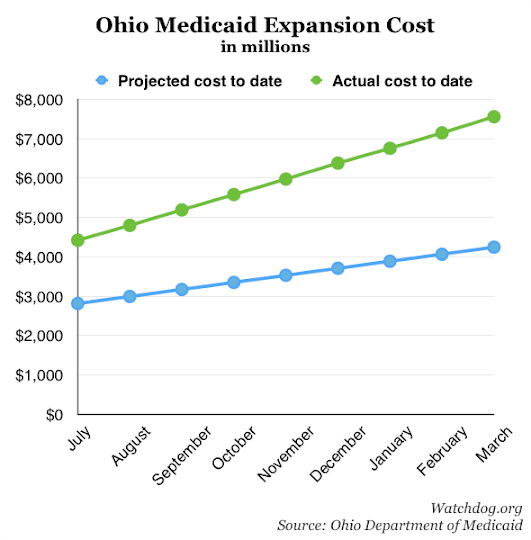 Ohio Medicaid expansion costs sailed farther past Gov. John Kasich’s projections in March, as total spending on the program topped the $7.5 billion mark. Expansion cost $411 million last month, making March the most expensive month yet. 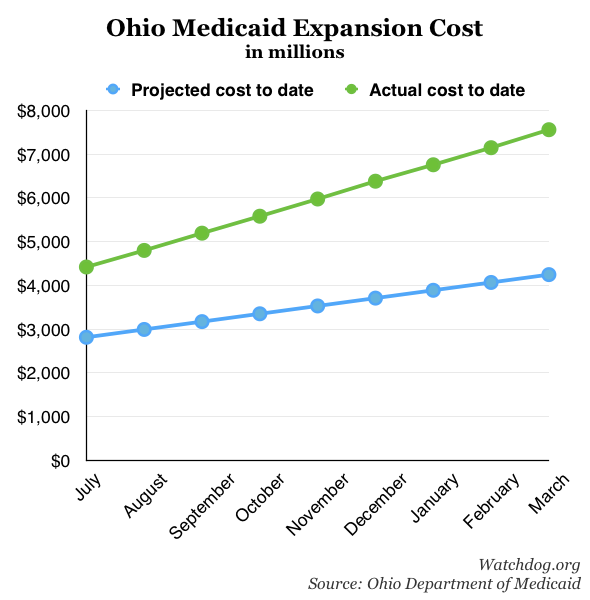 For the past six months, expansion costs reported by the Ohio Department of Medicaid averaged $394 million — dwarfing other state programs. Kasich’s budget office reported $312 million in primary and secondary education expenditures, $186 million in higher education expenditures, and $170 million in justice and public protection expenditures in March. The governor predicted that adding working-age adults with no kids and no disabilities to the Medicaid rolls under the 2010 federal health law would cost $14 billion from 2014-20. Actual spending puts Kasich’s Obamacare expansion on track to cost $28.5 billion by 2020. Kasich relied on a February 2013 study from the consulting firm Mercer for the Obamacare expansion cost projections he shared with legislators and the media in the months before he unilaterally expanded Medicaid. Expansion costs continue to outpace Kasich’s expectations primarily because Mercer underestimated how many Ohioans would sign up. Enrollment was 673,000 in March; Mercer estimated 447,000 would enroll by 2020. Mercer estimated that more than 80,000 expansion enrollees would move to Medicaid from private health insurance by 2016, but the Kasich administration does not know how many enrollees previously had insurance. The Kasich administration also does not know how many enrollees have jobs. 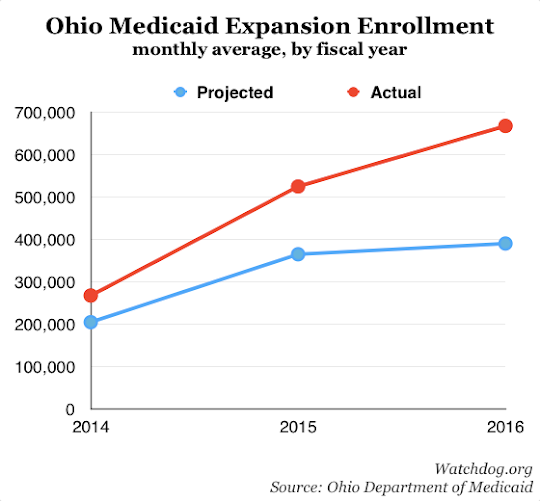 With three months left in the state’s fiscal 2016, average monthly expansion enrollment is 4.2 percent higher than budget projections the Ohio Department of Medicaid revised less than a year ago. Expansion costs are over budget by 7.5 percent, relative to last spring’s ODM projections. Even though Kasich’s Medicaid expansion is likely to cost twice as much as Kasich said it would by 2020, the Republican governor is running a presidential campaign built around the policy’s supposed success. “This has worked out great for us, and we’re saving money,” Kasich said when asked about Obamacare expansion at a CNN town hall several days later. Expanding Medicaid has helped Ohio’s balance sheet in the short-term, at the expense of current and future federal taxpayers. Despite the $19 trillion national debt, Obamacare promises funding for 100 percent of Medicaid expansion benefit costs through the end of this year. Federal funding will decline to 95 percent in 2017 and gradually drop to 90 percent by 2020. Under current law, Ohio taxpayers will be stuck with at least $20 million in additional monthly Obamacare expansion costs starting next January.